There is a common belief that damaged hair can’t be fixed, but actually, treating damaged hair is all about choosing the right products for hair nourishment. All hair, no matter the length or the texture, is susceptible to damage. Fortunately, it’s easy to get your beautiful locks back. It simply begins with the right diagnosis and can be fixed if you apply the right products and techniques. The terms ‘dry’ and ‘damaged’ are often used interchangeably, but the reality is they are very different. This is because dry and damaged hair can look very similar and often hair can be a combination of the two. So how can you tell? Appears dull and frizzy as opposed to glossy. The strands lack flexibility and cannot be gently stretched without breaking. The texture becomes rough and dry to the touch, often likened to a straw-like texture. Its important to note that while dry hair is not always damaged, damaged hair is almost always dry. Damaged hair is about more than just split ends. As your hair becomes damaged, the outside layer or cuticle of the strand begins to crack exposing the delicate centre to further damage. So, until you fix your damaged hair it will continue to degrade – leaving your hair looking drab. Perhaps it’s time to ask yourself, what is causing the damage to your locks? The reality is we don’t have to live in a hair care bubble to have healthy hair! If your hair is damaged, it can be fixed. We may not be able to totally prevent damage, but we can certainly counteract it. Be specific – hair care products that are specifically designed for damaged hair will do just that. Don’t discount the ability of your damage repair shampoo or intensive repair conditioner to do what it says on the label. Micro-trims – regular trims, yes even the tiniest trims, will help to revive dry hair. A micro-trim is a great way to prevent tired ends from splitting and further drying out the hair shaft. Treat yourself – Perhaps it’s time to bring out the big guns. 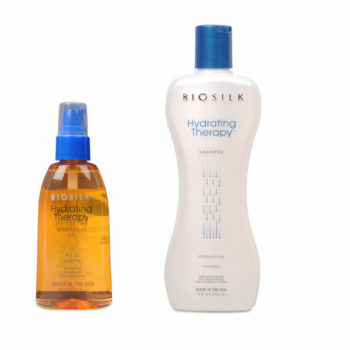 A treatment for damaged hair will moisturise thirsty locks and leave your hair looking and feeling hydrated. Protect your hair like you would your skin – Rain, hot winds, humidity, sun and even pollution can wreak havoc on your hair. Shield it from the elements with products such as UV sprays, thermal protectors and deep cleanser. You can also physically protect your hair from the elements by wearing a hat, or scarf or by using an umbrella. For many of us, our hair as an important part of our identity – a crown which you never really take off, so you want to wear it proudly. So get busy on that hair care routine baby!